Nicholas LOVES glow sticks. We must keep the glow stick companies in business because I always have to have a stock of glow sticks on hand. He loves to crack them and take them to bed with him but he also loves to crack them in the middle of the day. He especially loves to get his hands on an unopened box of 15 glow sticks and crack them all at once. He loves glow sticks. So we couldn’t pass up this experiment to let him make his own glow stick. 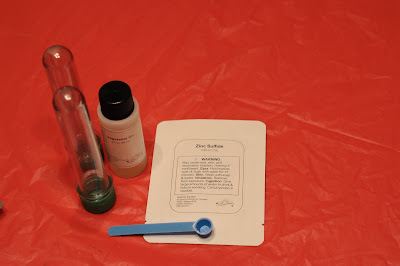 The ingredients were simple: zinc sulfide powder, vegetable oil, and water. 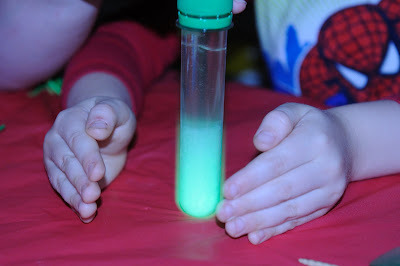 We got all of this in a kit but there are lots of sites on the internet that have directions for making your own glow sticks as well as where to locate the zinc sulfide powder. 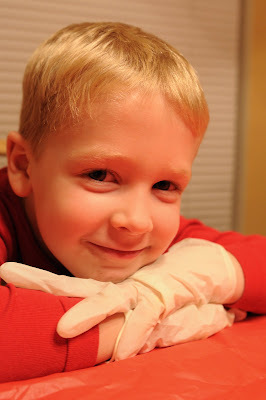 Nicholas loves doing science experiments because he gets to wear his safety gloves. However, these are obviously adult size gloves and they can’t be very safe if they inhibit him from grasping items well. Anyone know where I can find child-size disposable latex gloves? 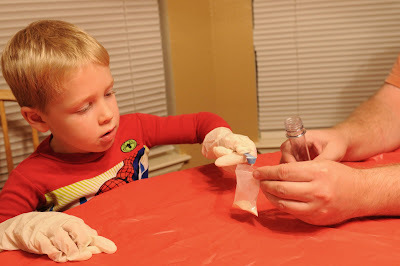 Daddy held the test tube while Nicholas measured the zinc sulfide and transferred it to the test tube. I love this! So cool. I can’t believe it glows that well. I think it will have better results then the incredible growing frogs sitting on my kitchen counter right now. You guys always do the NEATEST projects! When I was a kid the most exciting it got was when it rained and I could play with my Barbie’s outside in the puddles, pretending they were lakes! Nicholas is so lucky to have a creative and adventurous mom like you! the project looks interesting!! where did you obtain the kit from? 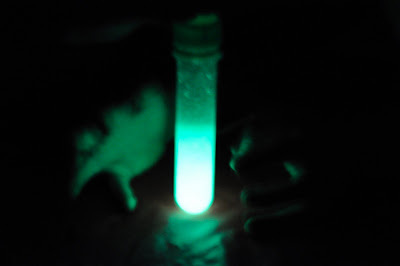 My daughter is doing a glow stick science project and yours looks very fun and simple. Where did you obtain the zinc sulfide powder kit you have displayed? The kit came from Constructive Playthings. They have a store in Plano at Parker and Independence and a website http://www.constructiveplaythings.com. Sign up for their email list because they usually send out $5 off coupons with a $25 purchase. Have fun! My daughter would be enthralled! This is going on our must-do list! You can make it without harsh chemicals, and possibly cheaper by using a bottle of mountain dew, a dash of baking soda and about 3 cap fulls of hydrogen peroxide. It will glow the same color yellowish green. Also, it may deter people from ever wanting to drink mountain dew again! How much zinc sulphide do you use at a time? What are the measurements for each component if we wanted to make this in test tubes? 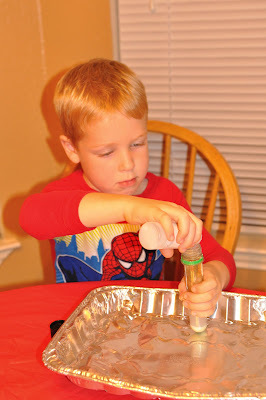 It sounds like an awesome activity and I would love to use for our VBS but I need to know how much to get and how much for each kid to do this experiment.